When the original TS-808 arrived everyone wanted one. Now the TS-808HW hand wired is here. Does this hand wired overdrive pedal sound like the original? 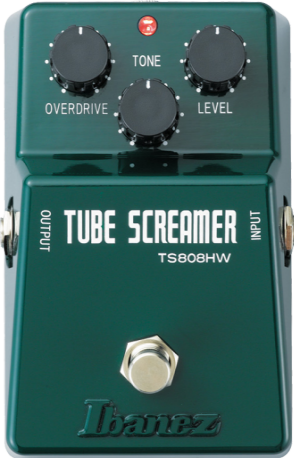 Does point-to-point wiring in this Tube Screamer make any difference? Find out in this review. What's all this about? Really, a hand wired limited edition Tube Screamer TS-808 HW with all the bells and whistles and yes, that's right, you do need a mortgage to own one of these; before this they probably only ever existed originally in someone's mind. It does not look anything really special? It's a bit squashed compared to my regular reissue TS-808 which is also reviewed on this website, so why the hell would anyone pay the money that this thing costs? It's really expensive. Actually there are a number of reasons, but for your (typically $350.00 or £280.00 street price) money this thing should really be cooking the breakfast (it costs as much as my wife on a non spending day ♥ she's nice really). 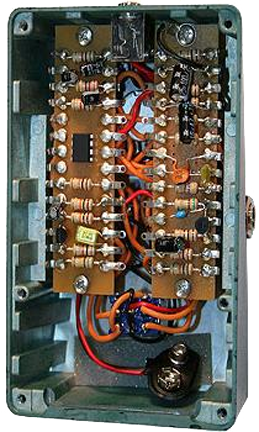 Let us firstly take a look inside this behemoth of a pedal (it is for a TS808). I see; there's something a bit different and just a bit special in here, this thing is completely hand wired. But does this make any difference whatsoever to the sound? Now there are disbelievers out there that might tell you that hand wired stuff is for old guys who always say it was better 'back in the day' and they don't make them like they used too; and all that other good stuff. But you know what? they really don't normally make these this way it's true! Look at all those resistors and capacitors just wired across a few patch boards; oh and look it's still got its little 8 pin chip in there; even though it does not have a soldered in socket like in the 'old days'. Ah but enough of this twaddle I hear you all say, none of that will make a jot of difference except maybe introduce noise and other bad things like circuit oscillations and instability in the pedal circuitry; you know, like in some of the hand wired point to point amps we have all used from time to time. Of course you might just all be wrong! The build quality of this overdrive distortion pedal is in fact second to none and someone has spent considerable time inside that little box and that's just one reason why Ibanez will tell you that this box is worth the money. Another reason is that the chip is in fact a very select chip that meets an exacting standard and all the components are really tight tolerance to where they were supposed to be in the original design. So every component is top class, real care has been spent on the manufacture of this pedal and it even comes in a fantastic collectors box because this is a limited edition pedal and there will be no more Ibanez says one day. In fact here I am in 2015 and this pedal is still for sale which is at least two or three years later. So much for limited editions or maybe they cannot sell them at these prices. But what's it like when you put this in front of your JMP100 or JTM45 or even in front of your Mesa Rectifier as many do these days? The truth is that this pedal does deliver the goods and compared with my standard TS-808 reissue this pedal sounds more transparent and clear in a funny kind of way even though its primarily a distortion pedal. It's a little hard to describe and the mp3's will not help much here either; but think about a pedal that sounds really clear almost clean; then it delivers the goods in that good old fashioned way (did I say that?) that the 'old boys' like to talk about. Actually most of us will know how to use a TS808 and this one is used in the same way. Personally I like to crank up the level and keep the overdrive low; this has a great effect of pumping up that modern amp you have while turning up the overdrive makes those older designed amps really sing; just as they used to do back in the darker days of no drive on your amp. But here's another tip. Use this pedal in the loop of a Mesa Boogie triple rectifier tube amp and it changes that hard to get the sound out of amp in to an awesome amp that it should have been originally; try it and you will likely agree. You could of course use any TS-808 for that though. Other than the aesthetics of this pedal and the vibe you get from owning one of these is it worth buying compared to a reissue? or another question might be should I buy an original and skip the HW and reissue? This really is expensive for a new pedal. My view is that if you want to buy a TS808 that's different than most you will ever normally see, and that you want to make some investment in some small way over the next 10 years or more then this is a great pedal to buy and I recommend it wholeheartedly. However, if you want 'that' sound from a TS-808 (whether its this pedal, a reissue of the regular one, or indeed an original), personally I would buy the TS-808 reissue and pass on this pedal. Checkout my review of the TS808 Reissue. Overall my points score goes from 1 to 10 and this TS808HW hand wired makes an average 7 on the scale, because the price, sound gain of which there is little and potential reliability issues could be a pain in the future. In any case, this is still a very nice pedal which I will be keeping because I know a good investment when I see one; maybe you should get one too before they are all gone and will never be released again. 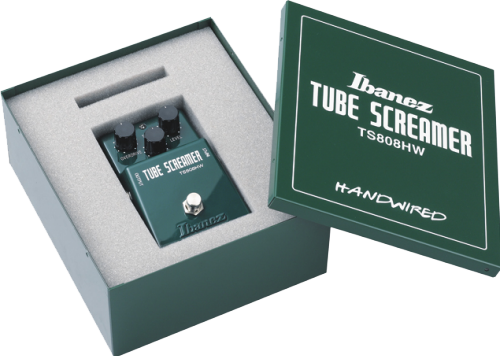 The Ibanez Tube Screamer, in its many versions and forms, can be found on pedal boards in every corner of the globe, on arena stages and in small studios and bedrooms. Its warm overdrive is a sound many players, from advanced to beginner, could never do without. Now, it gets even better with the release of the TS808HW, a hand-wired deluxe Tube Screamer built with the pro musician in mind. Encased in a special, heavy duty metal box, the TS808HW is hand-wired with select JRC4558D chips (same as the revered and often imitated TS808) and uses Japanese high-end MOGAMI OEC cable (AWG21). Equipped with True Bypass, this Tube Screamer sends pure guitar excitement to your amplifier with no tonal loss whatsoever. This is, by far, the most evolved Tube Screamer ever created.